Comments - Fantastic illustration of the defeat of the Mongol attempt to invade Japan in the thirteenth century. Two major military invasions by the Mongols were defeated in part through huge ocean storms, which caused the attackers to lose troops and supplies. 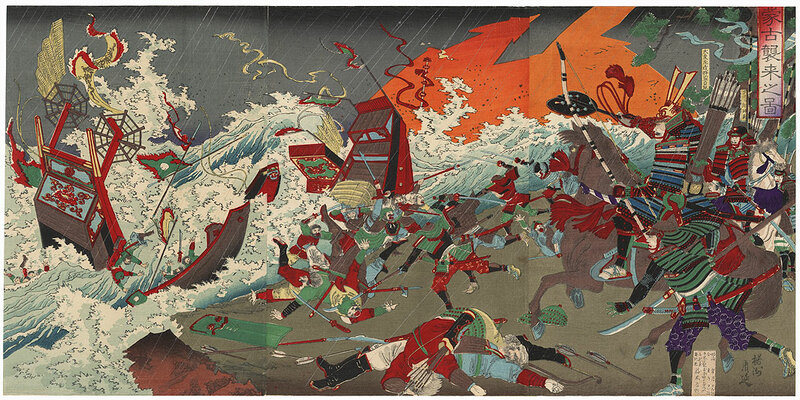 In this scene, the Japanese are assisted through divine intervention, as terrific winds drive the attackers ships on to the shore and a sheet of lightning flashes across the night sky. 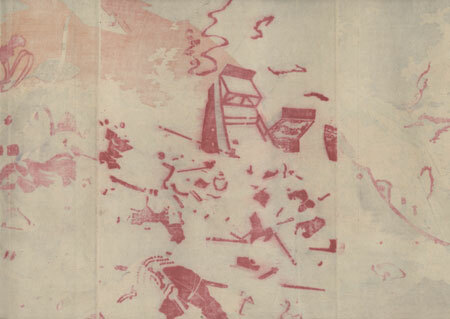 The ships capsize and shatter into pieces, sending the Mongols overboard into the white-capped waves. 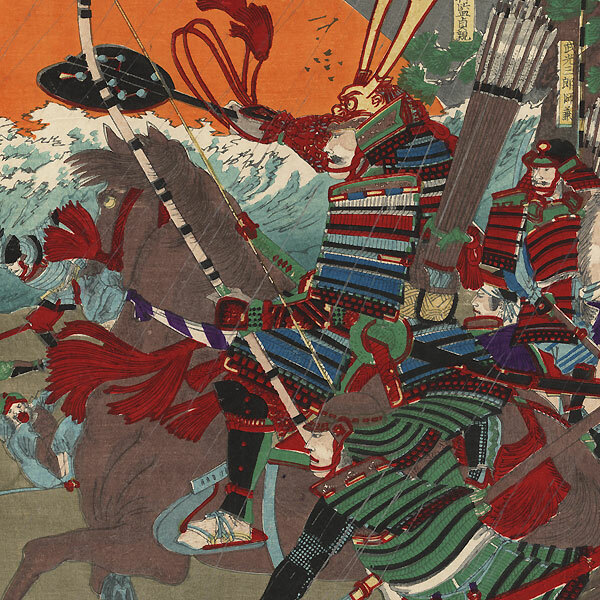 On shore at right, a general directs his troops from astride a gray horse as samurai meet the invaders with swords and naginata, wounded and dying men scattered on the ground. A lively action scene with wonderful detail, including a dusting of mica across the top of the sky. A rare and unusual Chikanobu subject and a terrific subject for a collector interested in Japanese history. Image Size - 13 1/2" x 27 7/8"
Condition - This print with excellent color and detail as shown. Three attached panels, backed with paper. Slight soiling. Please note: due to the size, this print may be shipped rolled. Please see photos for details. Good overall.